Is A Stock Correction Underway? Is a correction in stock indices really underway? Is that allowed? I don’t think so. Rulers Bernanke and Draghi have been quick to put their foot down and stomp every wave of selling. I suspect this time will not be any different. Stocks are clearly in a bubble that in my opinion, has now exceeded every bubble ever blown in history. Stocks have been puffed up by central banker intervention, manipulation, and inflation via currency expansion. Every now and then, stock prices threaten to crumble under the weight of reality. That is, everyone realizes that trying to borrow our way out of debt is insane, ridiculous, and will end in catastrophe. An economy supported by central bank infusions is not a sustainable economy. Stock prices should reflect this realization with a plummet. We are currently in one of those periods. Will the bubble now burst? I doubt it. The US election is just a few weeks away. 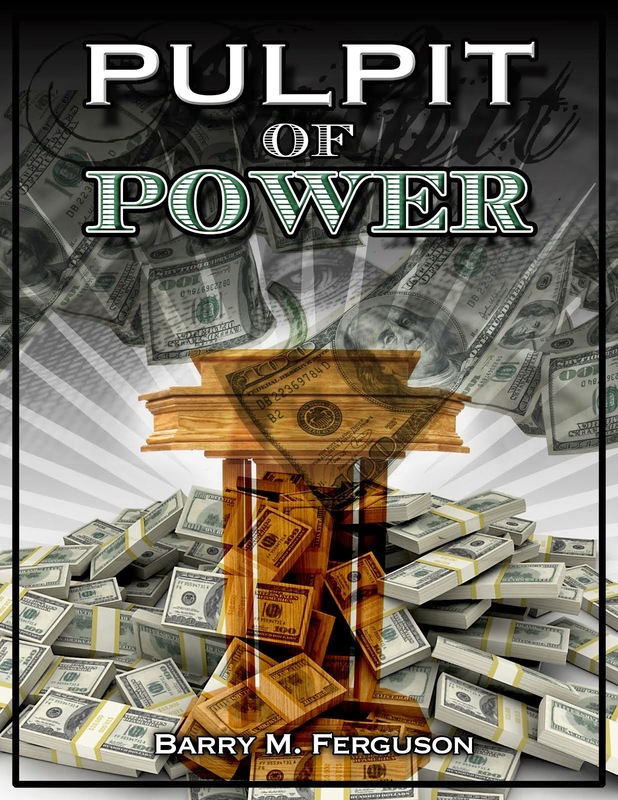 The American public will go to the polls and unleash upon the world another clueless puppet of the elite banking cartel to herd the sheople. Yet, most voters likely feel very strongly that their candidate can make things better. In the meantime, the current regime will make sure that all economic news is good for the next few weeks. Of course it is. The latest news this week is that Q3 GDP grew by 2% in the US. That number was driven by a 2% increase in consumer spending and an 8.5% gain in ‘long lasting goods’. Of course, the federal government kicked in with increased spending of 9.6%. Hasn’t the regime leader been telling the world that the US was ‘cutting’ spending? Obviously speeches are only for convenience of propaganda. Besides, the federal government spends more than a trillion than it takes in. What’s another 9.6% boost in spending? When we are already buried under tons of debt, what difference can a few more shovel-fulls on top of our heads make? Well, the regime had a 2% GDP growth number to support so they made sure the numbers were there! However, the 8.5% gain in ‘long lasting goods’ was very curious in a mendacious way. Most companies that produce ‘long lasting goods’ have been reporting a weakening demand story. In fact, corporate spending on capital goods decreased. So, we are to believe that the very people that run businesses are reducing their spending at the corporate level while they increase their own spending when they get home? And if so, wouldn’t their spending at home, as consumers, drive up demand for goods at the very companies that are reducing their spending? This is also quite odd considering that everyone on the planet agrees that economies everywhere on the globe are slowing. Warren Buffet said so. Shippers of goods say so. Regimes except for the US regime say so. While the US pretends to be a free nation, something very telling happened this past week. The presidential debates featuring the so-called third party candidates took place with Larry King moderating. Didn’t see it? Didn’t hear about it? Libertarian candidate Gary Johnson was brilliant and so far superior intellectually from the main party’s offerings that he almost appeared to be a different species. That is, a species with functioning brain cells. But here is the only thing everyone in the world should know. The debate for the presidency of the United States of America for these third party candidates was held on one television network. That network was the Al-Jazeera network. God forbid the American public hearing the truth. God forbid the American public overcome their profound ignorance. Thus, we have a stock bubble that is, and has been, orchestrated by central bankers. My guess is this cartel will not let the Dow slip below 13000 else the dopes that have been duped will realize that they have willingly been incarcerated by their ignorance and gluttony. And, Warden Bernanke has apparently decided to retire from the Fed in 2014. There is no way he will step down with a bear eating patrolling Wall Street. Look for stock indices to rise this week. Today is October 17, 2012. The US Commerce Department said that housing starts jumped 15% in September to the highest level in 4 years! Okay, I’ll give readers a few minutes to stop laughing. The ‘Commerce Department’ is always good for a belly laugh. Seriously, quit laughing so I can make a point. Okay, so housing starts are up the most in 4 years. That should really boost the Dow Jones Industrials. Uh-oh. As we move into the afternoon, the Dow is actually down 20 points. What? Does no one trust the US Commerce Department? The DOPE (Department of Pathological Embellishment) seems to have zero credibility. Or perhaps there is another perspective. Even if today’s housing number had a tiny speck of truth to it, instead of a it being a complete fabrication from a regime completely incapable of telling the truth about anything, we could also say that housing starts are the worst they have been in 22 years. 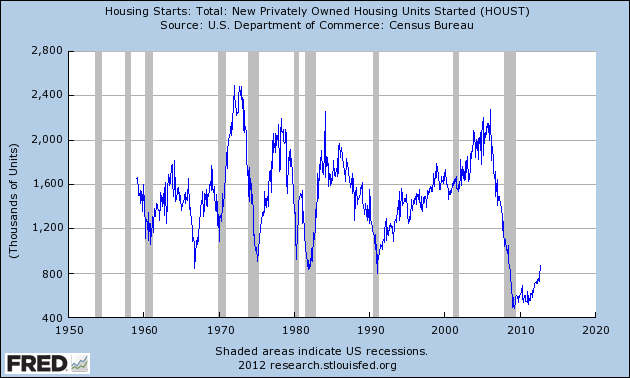 Take a look at the chart (below) compiled by the Fed and observe that housing starts are about what they were in 1990, or 22 years ago. We could also observe that housing starts are about half of what they were in year 2000. Maybe that’s why there is no rally in stocks today. Is housing an oasis or a mirage? Obviously, all ‘data’ these days is suspect. Clearly the regime has a story to sell and that story is one of economic recovery. Improved housing starts would be part of that ‘recovery’. So let’s apply some logic. I’m not an expert but most houses, if not all, have insulation and roofing. A big producer of that insulation and roofing is Owens Corning. What do they say about their business? If housing was really in a ‘recovery’, wouldn’t a maker of insulation and roofing be doing better as well? Uh, well actually, Owens Corning just announced on October 9, 2012 that they were lowering full-year expectations for their earnings citing weakness in roofing and composites businesses. That’s right. They ‘lowered’ earnings citing ‘weakness’ in their business. How much? They lowered full-year earnings from between $360 million - $420 million (given in August) to between $280 million - $310 million. That’s quite a decrease! The company says that business has ‘weakened over the past two quarters’. Funny, the regime wants us to believe that home building has increased. Oh well, maybe builders are now building homes without insulation or roofing. Depending on whatever we want to believe, the economic recovery is either an oasis or mirage. Housing is either the strongest its been in 4 years or the weakest in 22 years. It’s all in perspective. Truth, however, does not entertain perspective.